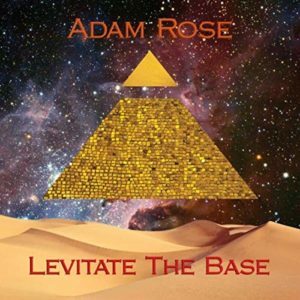 A funky drum beat, popping bass, and heavy wah-wah guitar make “Platinum Grime” move, opening, as it does Adam Rose’s instrumental album, Levitate the Base. Pittsburgh, Pennsylvania multi-instrumentalist, vocalist, composer, and producer, Rose dabbles in quite a bit of stuff, but mainly he weaves his magic around guitar compositions and voicings in his playing here. Very expressive guitar playing that it is. Songs like “Slam Dandy,” with its big rock guitar pull-offs and tricks, “Freaky Fried Flapjacks,” with just as quick clean electric playing and then “Helena,” a ballad of studied and vibrato-bar picking, especially show the fine feel Rose manages across the frets. Rose also plays the drums, bass, keys, trumpet, and violin. On “Paisley Arcade” his organ playing and cool sly drumming make for another one of the better songs on Levitate the Base, and the string bed he lays down in the last tune “Isles of Avalon” is stunning. In the grand tradition of Pink Floyd and King Crimson, as well as bands like Russian Circles and Joe Satriani’s work, we get solid instrumental songwriting, production, and playing from Adam Rose on Levitate the Base. This is one man who knows his way around a studio as well as a fretboard. Great stuff!